Mary Lane: Her accounts of betrayal, heartbreak and rebounding are exactly what you need to get through the day whole. 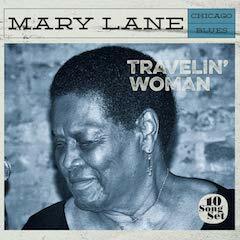 Echoes of Big Mama Thornton and Koko Taylor abound in Chicago blues belter Mary Lane’s first new long player in some 20 years and first for the newly formed Women of the Blues label. Those formidable female blues shouter touchstones further link the 83-year-old Ms. Lane to those that came before her—the likes of Bessie Smith, Mamie Smith, Memphis Minnie, et al. That is to say, Mary Lane taps into a profound strain of history, some of which she witnessed in person, in asserting herself, at long last, at the forefront of the contemporary blues scene. 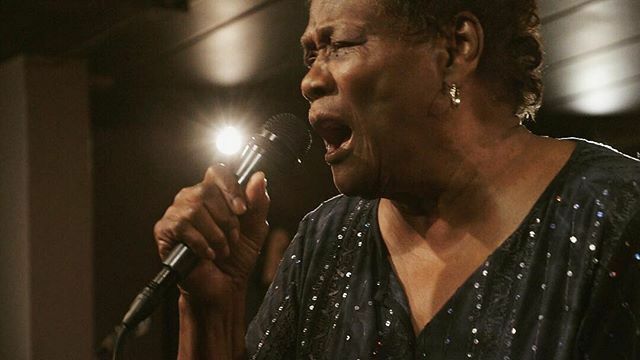 But like Big Mama Thornton, Ms. Lane, with a lived-in voice that is not pretty but undeniably commanding and emotionally resonant with a lot of muscle behind it, is both masculine and feminine in her delivery and timbre. Big Mama once identified Chicago blues pioneer Big Maceo as one of her favorites, and it’s easy to hear Mary Lane slaying audiences with a take on Big Maceo’s “Worried Life Blues,” a song whose key lyric, “Someday baby, I ain’t gonna worry my life anymore,” is one Ms. Lane echoes in her own way on several occasions over the course of Travelin’ Woman. If your man or woman has done you wrong, Mary Lane’s accounts of betrayal, heartbreak and rebounding are exactly what you need to get through the day whole. The big difference between her and many of her blues forebears is Mary Lane’s avowed belief in the persistence of love—she hangs in and hangs on, not worrying her life anymore but believing in the persistence of love. Sassy, no-nonsense, vulnerable yet self-reliant, Ms. Lane cuts a formidable swath through 10 straight-ahead original tunes, all co-writes with producer/guitarist Jim Tullio save for one memorable acoustic number, “Make Up Your Mind,” a desolate Delta blues howl addressed to a wandering mate, featuring Lane, shattered but resilient, backed by co-writer Colin Linden’s spare, lonesome slide dobro. As the album’s final tune, it sums up much of what has gone before it, and it’s rather fitting that we find the artist here almost alone, in a austere setting, moaning, “Why you left me standing here by myself/’cause you know, you know I love you/seem like you want somebody else/see I give you all my lovin’, but you still treat me like a dog…’ The sentiment, the scratchy tone of her voice, the magnitude of sheer ache in her soul combine to sum up the level of distress she has revealed from the album opening title track to the last fading notes Linden plays. Apart from Linden’s virtuosic instrumental display, Ms. Lane is supported throughout by an ace band anchored by Tullio on electric guitar and bass, with some reliable blues names pitching in here and there. The stomping, autobiographical title track—which may be about her wanderlust in seeking her own place in the music world or about a journey to discover something essential about herself–soars behind Louie Zagoras’s screaming slide solo with added heft courtesy a horn section featuring the legendary Gene “Daddy G” Barge on sax. A lighthearted, freewheeling, Big Maceo-style workout addressed to another absent partner, “Some People Say I’m Crazy” finds Lane tender-hearted in anticipation of reuniting with her man, as blues harp titan Corky Siegal weaves in anxious solo spurts to underscore the singer’s resolve as she vows, “I’m gonna keep on tryin’, tryin’ by myself/see I love you and I need you and I don’t want nobody else…I want you to know you forever on my mind…”—Big Maceo might have walked away in “Worried Life Blues,” but Mary Lane believes in tomorrow promising “a better day,” this sunny outlook in the face of despair being one of the artist’s most appealing characteristics. The formidable Sam Butler steps up on “Raining in My Heart” (Mary’s song, not Buddy Holly’s) with some pungent, wailing guitar work to add additional sizzle to a rocking track wherein Ms. Lane seems unusually sanguine, if puzzled, by her man running off again because “I wonder why you treat me so mean/Yes, you know I’m the goodest thing that you ever seen.” With Chris “Hambone” Cameron on B3, Lane delivers her finest performance on the disc in rolling out a nuanced, heartfelt vocal on “Let Me Into Your Heart,” a gospel-influenced love ballad on which her tender side reigns supreme, as does her innate optimism even in the face of losing her man. If she’s not giving up, why should anyone else? I repeat, Travelin’ Woman is good for what ails your heart, courtesy a woman who has earned her wisdom the hard way and emerged from her trials with body, soul and heart intact. Young whippersnappers should take note.